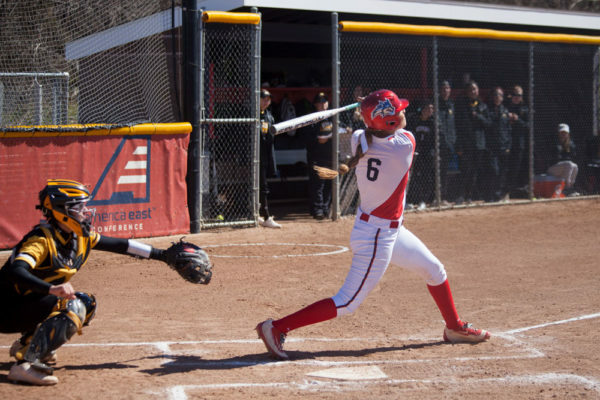 The Stony Brook softball team traveled to Fort Myers, Florida over the weekend to play against Wright State, the University of Connecticut, Southern Illinois University and Florida Gulf Coast in the Florida Gulf Coast University Invitational. The team finished with two victories in five matchups. The Seawolves rebounded from three consecutive losses to top the Raiders for the second time in the tournament Sunday morning. The team performed well offensively, recording 10 hits against the Raiders. Junior catcher Irene Rivera capitalized off a throwing error by the shortstop by scoring the Seawolves’ first run. Sophomore infielder Allyssa Malony would drive in two runs with a single to left field later in the fourth inning to give the team a 3-0 lead. After the Raiders cut the lead down to one run in the bottom half of the fourth, Rivera and sophomore pitcher Taylor Pechin responded with two RBI hits to give the team a 5-2 lead which the Seawolves would ultimately hold to win. Southern Illinois took on Stony Brook in game four, and the team started the game on top and never looked back. After a leadoff single, sophomore catcher Katelyn Massa doubled into centerfield to drive in the team’s first run. Massa advanced to third off an error and scored following a single to left field from senior infielder Sydney Jones to put the team up 2-0. Massa continued to give the Seawolves defense trouble in the following inning. She hit another double to left field to drive in two runs and gave the Salukis a 4-0 lead. She hit her third double of the game in the top of the sixth to give her team a five-run lead. The Seawolves tried to rally back in the bottom of the seventh by getting two runners on base with two outs. The team was able to drive in one run before ultimately succumbing to Southern Illinois University 6-2. The UConn Huskies struck first in the first inning following two consecutive walks by senior pitcher Maddy Neales in Stony Brook’s third game of the tournament. She struggled to maintain composure, erratically throwing back-to-back passed balls to advance the runners. Redshirt freshman Olivia Sapp scored the Huskies first run after Rivera’s throw to second base was fumbled by senior infielder Chelsea Evans and Sapp made it home. The Seawolves loaded the bases on three straight singles with one out in the top of third. Sophomore first baseman Melissa Rahrich drove in a run off a sacrifice fly to tie the game at 1-1. The team was unable to capitalize any further despite having runners on second and third, leaving both in scoring position. Both teams remained quiet offensively until two Huskies reached base to begin the bottom of the fifth. Sophomore pitcher Carly Cutler grounded out into a fielder’s choice to allow the runner to score, giving the Huskies a 2-1 lead. This would prove to be enough as UConn shut down the Stony Brook offense for the victory. The second game had the Seawolves taking on the Florida Gulf Coast Eagles. The Seawolves’ opponent got on the scoreboard first. Eagles senior infielder Brittany McGuire started off the bottom of the second inning with a single to left field. McGuire would score following back-to-back Stony Brook errors after advancing to second from a fielder’s choice. Stony Brook failed to produce any offense until senior infielder Ileana Torres started off the top of the fourth with a single to third base. Torres would advance to second following a fielder’s choice and score off a single up the middle by Rivera to tie the game at 1. Both teams would fail to capitalize offensively until junior catcher Bri Bennett singled to third base to drive in freshman pinch runner Ashley Biddle and give the Eagles the lead in the bottom of the sixth. The Seawolves would fail to respond the following inning, despite loading the bases, and fall to the Eagles 2-1. In the first game of the tournament, Stony Brook took on Wright State. Both of Wright State’s runs were scored in the second inning. Sophomore outfielder Rebekah Lenos scored after freshman catcher Kaitlyn Skinner sent a double to right centerfield. Skinner would later score off a single by freshman infielder Kelly Dillow. The Seawolves responded in the bottom half of the inning after Evans advanced to second base following a pass ball. Malony hit a single up the middle to drive in Evans. Freshman infielder Nicole McCarville drove her home with a single up the middle in her first collegiate at-bat to tie the game at two. Pechin drove in two runs with a hit down the left field line to give the Seawolves a 4-2 in the bottom of the fifth. A single by Torres was enough for the 5-2 victory. The Seawolves will travel to the West Coast to participate in the UC Riverside Highlander Classic tournament in Riverside, California. The team is in action next against Saint Mary’s on Friday, March 2 at 9:30 a.m.